Come here to know, what are normal TSH levels, safe TSH ranges, and what does Normal TSH level mean in your blood test? TSH is the Thyroid Stimulating Hormone, initial thyroid function marker. Small variations in TSH ranges can occur due to different laboratory methods used and the time of day your blood TSH test was taken. 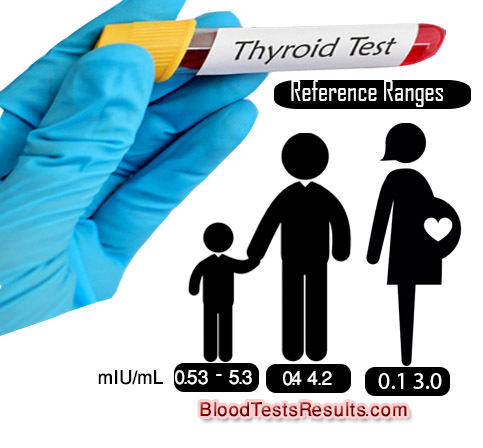 Normal TSH level means the TSH blood test values and numbers that studies in people with healthy thyroid function tests. Normal levels of tsh test is an indicator of a healthy thyroid gland, which means no hypothyroidism with these numbers, and no cancer with these numbers as well, although a case called “Euthyroid” shows normal TSH levels with unreal/untrue high thyroid hormone levels. mIU/L means milli international units per liter of blood, a measurement unit for tsh 3rd generation normal ranges. TSH normal values from zero to 2.5 is optimal. TSH test results from 2.6 to 4.0 is at risk. Goal TSH level for patients on thyroxine is between 0.5 to 2.5 mU/L. TSH is the most well-studied marker for thyroid function evaluation. TSH is considered the most sensitive and accurate indicator of thyroid function by most endocrinologists and other doctors. TSH normal reference ranges are from the American Thyroid Association and published in the journal Thyroid. Also, some thyroid testing kits may recommend another normal reference.